This crowd pleaser recalls days spent at the beach. 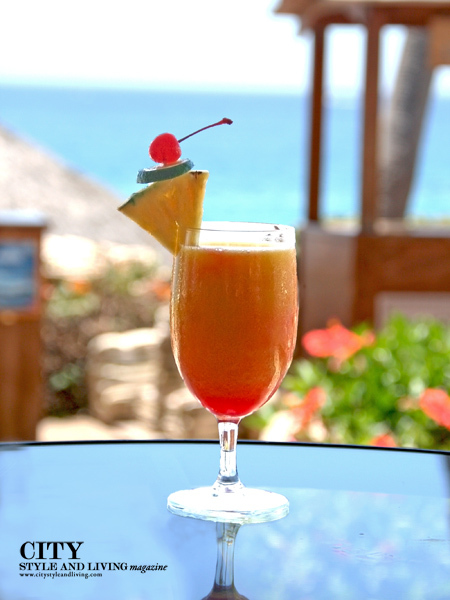 Combine 4 ounces (120 ml) coconut rum, 2 ounces (60 ml) dark rum, 2 ounces (60 ml) coffee liqueur, 1 ounce (30 ml) 151 proof rum, 8 ounces (240 ml) orange juice, 10 ounces (300 ml) pineapple juice, and 2 ounces (60 ml) grenadine and 1 cup (250 ml) in a blender. Blend until mixture is smooth. Add a dash of Angostura Bitters. Garnish with slice of pineapple, lime and cherry. This original article first appeared in City Style and Living Summer 2014 issue.